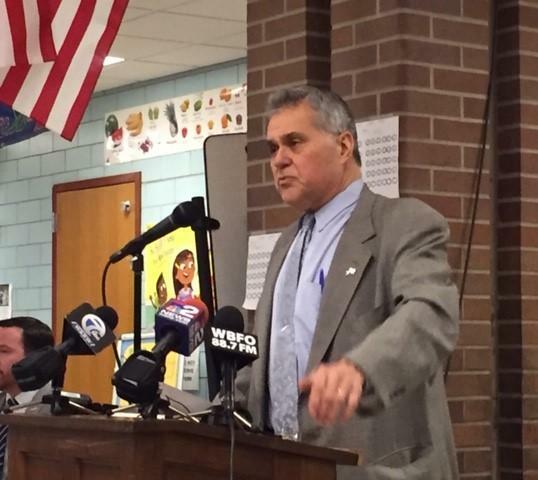 The issue at Southside Elementary School Wednesday night was policing in Buffalo, particularly in South Buffalo, where many residents perceive the city is cutting back on police efforts to move officers to other communities while crime is becoming more of an issue in South Buffalo. Fillmore Common Councilmember Dave Franczyk spoke out against the changes proposed for Buffalo Police detectives. The meeting came together because South Buffalo is a community that can organize quickly and includes many police officers and firefighters who know what's going on at home and at work. Retired Detective Mario Pratts called on the nieghborhood to push back hard. "Don't wait until it's unfixable," Pratts said. "This is the time for South Buffalo to scream for more. We have the first district house. We have Taj Mahals across the city. We could get another one." The meeting was precipitated by BPD plans to shift detectives to dayside, continuing cuts in detective squads and cutting one of two captains in A District, which covers South Buffalo and most of the Lovejoy and Fillmore districts. The job shifts are in abeyance pending an April union arbitration process. Earlier in the day, the Police Benevolent Association forced the BPD to back off on plans to shift detectives to days by filing a grievance. That will not be heard until April, so any change cannot take effect until July. Fillmore Common Councilmember David Franczyk said policing in daylight is a bad idea. "People got to take off from work. The trail is already getting cold. So I don't know how they can justify that," Franczyk said. "If it's a money grab, not a money grab, but if they try to do that for budgetary reasons, we should be very, very careful before we tinker with budget issues where it comes to our lives and public safety." 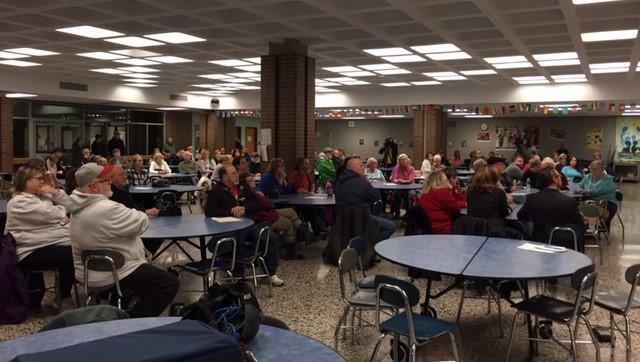 A large crowd turned out on short notice for the meeting at Southside Elementary School. The relatively crowded school cafeteria was told by audience members of serious problems in the department, from staffing cutbacks to the inability to get enough patrol cars on the road because there aren't enough mechanics in the police garage. The BPD is short-handed because of significant retirements and a new class from the academy isn't quite ready to be on the street. Many of those who spoke saw the changes as an attack on South Buffalo. "I'm here because it seems like A District, South Buffalo, the Valley, the First Ward, all of us, we always get singled out to be dumped on," said speaker Dawn Carpino. "They closed Precinct 7 on Louisiana. Now they want to do this. When do most of the crimes take place? At night. When do we need the detectives? At night." Some of those present said they are good citizens who pay their taxes and see their safety deterioriating amid rising problems with opioids overdoses and suicides. Police brass are supposed to appear before the Common Council's Community Development Committee on Tuesday to talk about why the changes. Big changes are in the works for the Buffalo Police Department and many of them were greeted with derision by the Common Council Tuesday.